This Rhubarb Peach Strawberry Crumble with fresh coconut milk yoghurt is to die for. It is naturally sweet and tangy and won’t create a dramatic spike in your blood sugar. It is so easy to make and drop dead delicious. With this recipe. you’re pretty much guaranteed success. I am always happy when it’s rhubarb season. I just love the tart, tangy flavor of rhubarb. 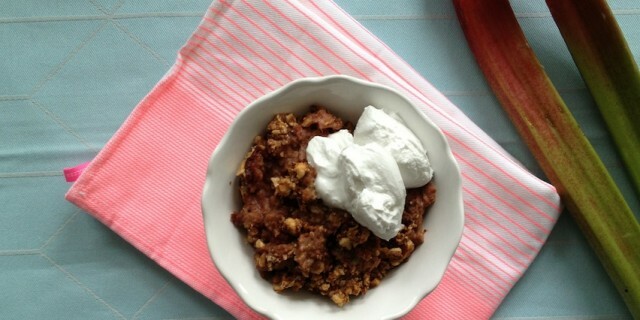 I like to make rhubarb crumble as soon as I get the first batch of rhubarb. I have wanted to make this recipe for quite a while now but I never had all the ingredients at home that I planned to use. Today I decided to just work with whatever I had in my kitchen cabinets and I love the end result. Instead of using lots of sugar to balance out the tartness of the rhubarb, I decided to add some naturally sweet fruits. I used some of the first flat peaches of the season and some fresh, new strawberries. To keep in some of that tartness that I love so much about rhubarb, I added some balsamic vinegar. For the gluten-free crumble topping, I used almond and coconut flour. As I didn’t have any almond flour at home, I was happy to find some unshelled almonds. I coarsely ground them in my dry blender. The course almond flour works brilliantly in this recipe. I tried different combinations of the nuts I had at home for the topping, tasting to find the right balance of flavors. The combination of hazelnuts and brasil nuts was my absolute favorite. Hazelnuts have a lovely roasted, buttery flavor and the brasil nuts add a mild, sweet creamy flavor. They both combines well with the grated coconut. The fine coconut flour and the coconut oil bring the crumble together. This Rhubarb Peach Strawberry Crumble is so easy to make, it is low in sugar and it’s drop dead delicious. I enjoyed this crumble so much, that it was finished before I knew it. I served it with a few scoops of coconut milk yoghurt. The freshness and tanginess of the coconut yoghurt makes this crumble even more heavenly. I am 100% sure that using coconut ice cream would work wonders too. A few scoops of coconut ice cream or coconut milk yoghurt to serve. Add rhubarb, peaches and strawberries to a bowl. Mix in balsamic vinegar and 1-2 tbsp of sugar. If the flat peaches and strawberries are very sweet, you can add less sugar. Allow to macerate for 10-15 minutes. Grease a square baking tray with coconut oil. Pour the rhubarb filling evenly into the baking tray. If you don’t have any almond flour, grind the almonds into a fine flour using a food processor or ‘dry’ blender. Mix all crumble mixture ingredients into a separate bowl. Make sure the coconut oil is mixed in well. Cover the rhubarb filling evenly with the crumb mixture. Bake for 35-45 minutes, until the juices are thick and syrupy and the crumble topping is crunchy and beautifully browned. One Response to "Rhubarb Peach Strawberry Crumble"